The vibrant colors of flowers, fruits, veggies and other market goods, along with the luscious green backgrounds of our markets make a farmers market a wonderful backdrop. And each week, shoppers and artists alike can be found capturing these beautiful colors through photography, paint and video. 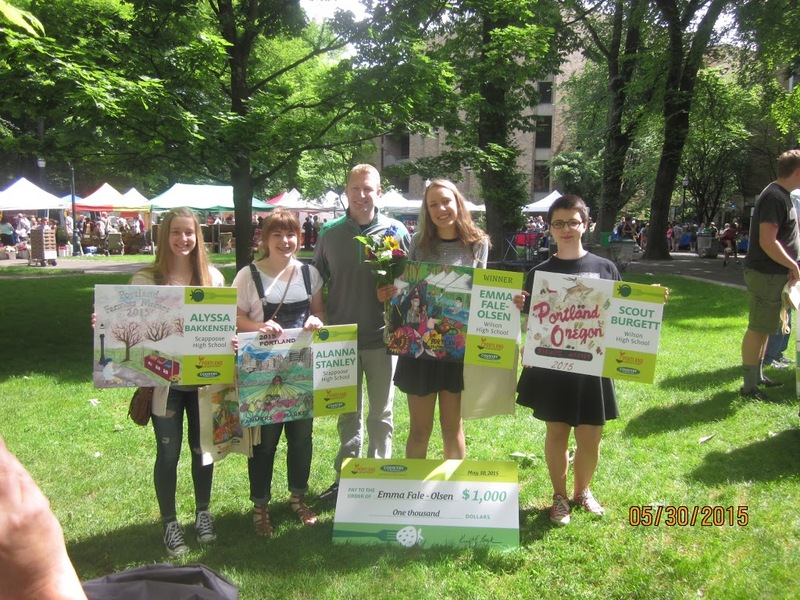 To help celebrate this vibrancy, PFM sponsor COUNTRY Financial® invites local high school students to submit their design each year for the annual Portland Farmers Market reusable bag design contest. Seventy high school students in Willamette Valley submitted their designs for the fifth annual contest. Emma Fale-Olsen, a sophomore at Wilson High School was chosen as the winner for her colorful depiction of the market. Her artwork will be featured on hundreds of farmers market bags throughout the season and receive a $1,000 scholarship from COUNTRY Financial. Two runners-up were also named. Freshman Alyssa Bakkensen and sophomore Alanna Stanley, from Scappoose High School will receive a $500 scholarship for their designs. Scout Burgett, a sophomore from Wilson High School, was selected as the People’s Choice winner after her design received the most votes from the community at a gallery event held in April. Burgett received a $250 scholarship for her design. Congratulations Emma, Alyssa, Alanna and Scout! when is the next bag design contest and is it limited only to high school students? The next bag design contest will be Spring of 2016. I’m not sure the exact timing but it usually falls around April. It is coordinated by Country Financial and yes, it is only for high school students.